"This is an old family recipe with a touch of Californian flair." In a large bowl, mix the beef, onion, green bell pepper, celery, eggs, soy sauce, and ketchup. Season with basil, parsley, oregano, garlic powder, and 2 teaspoons pepper. Mix in 1/2 cup oats. Gradually mix in remaining oats 1/4 cup at a time until the beef mixture is firm but not stiff. Transfer to the prepared baking pan, and form into a loaf shape. In a small bowl, mix the brown sugar, ketchup, brown mustard, mesquite smoke flavoring, 1/2 teaspoon pepper, and paprika. Drizzle evenly over the meat loaf. 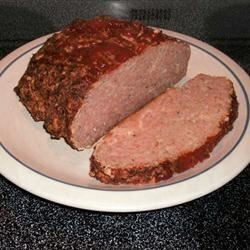 Bake meat loaf 1 hour in the preheated oven, or to a minimum temperature of 160 degrees F (72 degrees F). it was good but very spicy and the taste of all those dried herbs was overpowering. I won't make it again this way. Best meatloaf I've ever had!!! My husband loved it, but I thought it was overly spiced.